TORONTO, ON – This past September, a homebrewing competition took place during Toronto Beer Week, with prizes including the chance for winners in several categories to have their beer brewed commercially at a local brewery. One of the participating breweries was Amsterdam Brewing, and they’ve announced that winning brewer Jeremy Skorochid recently visited for a brew day. 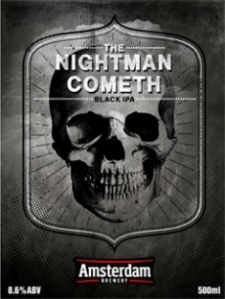 The result was a production batch of Skorochid’s Black IPA recipe, The Nightman Cometh. Similar to last year’s winner, Teichert Smoked Porter, the beer will be available exclusively at the Amsterdam retail store where it will be sold in 500 ml bottles on a first come first served basis. It’s expected to be released in early December. GOTTA GET ME SOME OF THIS BREW !!!!!!!! I’LL BE WAITIN’ NIGHTMAN !!!!!!!!!!!!!!!!!!!!!! p.s. GREAT LABEL, CAN HARDY WAIT !!!!!!! !